Autumn Days are here in Denver. After enjoying the colorful aspens in the mountains with daughter, Steph, and then our friend, Debi, two weeks later, autumn has finally arrived in Denver. The green ash, honey locust, cottonwood, apples, and crab apples are prolific in our University of Denver neighborhood. As a result, brilliant golds line the street on our way to campus. I feel a bit like Dorothy walking along the yellow-brick road!! This week we’ve reached lows of 24 degrees, but the highs still stretch into the 60s and this weekend we’re headed to the mid-70s. In the higher altitude, temperatures tend to advance quickly with the sunshine and then cool off just as fast once the sun sneaks behind the Rocky Mountains by 6:30. It seems like autumn also creates the need for some home details. The furnace is now in use. We added a small humidifier to our main level to raise the humidity to a more comfortable level. The 10%-25% humidity wrecks havoc on our skin, lips, and nasal passages! It will only worsen as it gets colder. The sprinkler company came out last week and blew out the irrigation lines so they won’t freeze with dipping temperatures. Without the added moisture to the lawn, perhaps we won’t have to mow anymore this season. Our management company’s maintenance man came out today to add weather stripping to our back door. After rain or irrigation, worms would slither beneath the door and make their way down 2-3 basement steps before their demise. Wolf spiders also took advantage of the narrow passage to gain entry. Yucko!! I’ve begun the process of dismantling windows and cleaning them. The top sash has been painted shut, creating a challenge. It appears that the windows haven’t been cleaned in many years for the cloths I use come away literally coated in black. To make the task easier, I purchased a cloth applicator, squeegee, and chamois. Saturday I will return to the windows like a pro!! Three weeks ago my friend Debi arrived from Illinois. We had a perfect gal-pal time with many miles logged as part of our mountain road-trip adventure. I zipped out after my Spanish class to get her at the airport on Thursday night. On Friday we took a short drive up to Red Rock Park with its beautiful natural amphitheater. I knew that it would help to keep her close to mile-high for the day to adjust to the higher elevation. We had a fairly clear view of Denver from our vantage point at the top of the amphitheater. The storm clouds brewed and brought some rain, but mostly just added drama to the landscape against the red rocks and fall vegetation. On Saturday we left by mid-morning on our mountain adventure. Debi had never been to the Colorado mountains so I was thrilled to introduce her to them. We took I-70 up to Loveland Pass. Driving U.S. 6 up and over Loveland Pass gave us daunting vistas of the valley with Loveland ski area, winding hairpin curves, and I-70 far below. The Pass was the highest point Debi has ever experienced at 11,990 feet. We managed to remain standing despite the gusty and frigid winds. From Loveland Pass we drove by Arapahoe Basin and Keystone ski resorts to nab I-70 again. I decided to take her on a loop of sorts from that point. Up and over Vail Pass we drove past Copper Mountain and Vail Mountain ski areas. We lunched in Vail Village on some very yummy, spicy chili, which hit the spot since it was nippy outdoors. Vail Village is picturesque and designed much like a European mountain village. In some ways I felt like I was back in Austria and Germany with their chalets, colorful flowers in window boxes, cobblestone walkways, covered bridges, and hanging baskets of flowers. A Maypole brought back memories of Sweden, which Steve and I experienced just 4 months ago. Gore Creek runs through Vail so the sound of it moving through town added to the ambiance. As the day was getting away from us, we drove onward to U.S. 24, pausing to capture photos of 13,100 Notch Mountain, an abandoned mining town, and the Red Cliff Bridge (built in 1940 and spans the Eagle River.) We traveled up and over Tennessee Pass to Leadville, where we caught route 19. This route took us over Fremont Pass. Many of the deciduous trees had already dropped their leaves, but occasionally we would note a stand of golden aspens. Descending Fremont Pass along Copper Mountain ski resort, the shadows were deepening and the gray day only accentuated the need to be done with our drive. Our overnight spot was Frisco Lodge in Frisco, where Steve and I stayed back in August. Only this time the leaves were gold and fluffy snowflakes were falling! The next morning we savored our complimentary breakfast at the Lodge with homemade Belgian waffles. While it was mostly sunny, a line of clouds seemed to quickly stream from the north and along the top of the 10 mile Range between Frisco and Breckenridge. The day was young, so we decided that we needed to experience more passes on our way home. From Frisco and through Breckenridge, we soaked up the warm sunshine. Out of Breckenridge we paused along Blue River to snag some photo opportunities with Quandary Peak as the back drop with its rather angular peak. Hoosier Pass was the first pass for the day and the wind gusts made it challenging at best to hold our cameras steady for photos. The clouds literally appeared to be speed racing! We descended Hoosier Pass through Alma (the highest developed municipality in the U.S.) and into Fairplay, where we stopped at the Java Moose for hot tea and coffee. Fairplay is on the fringe of South Park (many of you know of South Park from TV). South Park is an impressive, 1,000 square mile, high grassland basin that is rimmed in mountain ranges. Designated as a National Heritage Area, it was originally inhabited by the Ute Indians before miners and settlers came to the area. 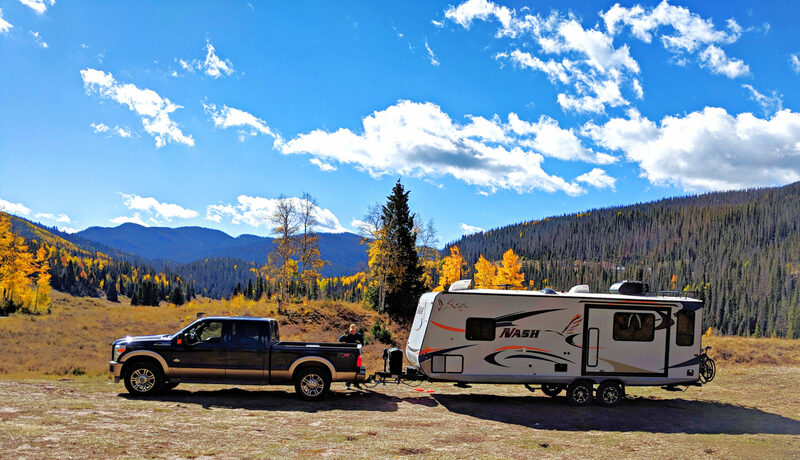 We climbed out of South Park on U.S. 285 and up yet another pass…our final one, this one Kenosha Pass. It is through here that the popular Colorado Trail passes and continues across the state. (Used by many outdoor enthusiasts). Kenosha Pass gave way to a winding road with Sunday traffic that wanted to go at a rip-roarin’ pace. As it was still early in the afternoon, we couldn’t resist being adventurous and taking Hall Valley Road off of the main highway to investigate where it went. After bumping along on the gravel, negotiating occasional large cobblestones and eroded holes, and realizing the road was rapidly narrowing, we decided to turn around. The scenery was breathtaking with swatches of colorful trees and short willows in the valley. We took advantage of a pull-off spot to admire a small creek as it tumbled over and around boulders. Our final stop was near Shawnee, which is surrounded by Pike National Forest. With the winding branch of the Platte River through the valley, the warm golds of the leaves, and the dramatic sky, we were able to satisfy our shutter-bug tendencies!! A stop for hot tea across the road at The Shawnee Tea Room provided the perfect ending for our mountain road-trip adventure. Needless to say, we had a most memorable weekend. I appreciate Debi who made the trip over her 4-day break from school. Monday came all too soon as I made the trip back to the airport for Debi to catch her flight. Two weeks ago Steve and I headed to Orlando Florida for the wedding of Brent (who we’ve known since he was born in IL…he’s like a nephew as are his brothers). Brent, the dashing groom, married Emma, who was a beautiful bride. We were honored to be included as guests. What a blessing to have known Holly, Rob, and their family since 1980. We met when Jeremy and Matt were nearly one year old. Holly and I were standing at a swing set at a park in Woodridge, Illinois, each pushing our little guys in the baby swings. The next thing you know…it’s 30 years later and their youngest son has just married. We enjoyed time with Matt, Steph, Taylor, and Olivia as well as Tim. Seeing Holly and Rob’s extended family was wonderful, since our lives have intersected at different points over the years. As part of our time over the wedding weekend, we also went to Sea World with the family. Now we have more great memories! How grateful we are for friends! Long-winded as always, I leave this post and hope that you are well and experiencing delightful autumn days too. Howdy from our New Frontier. Did you know that we are University of Denver Pioneers?! As a pioneer and thinking about frontier life, I couldn’t help but do a little pondering. I was thinking about the Western Frontier as pioneers, miners, missionaries, and railways pressed their way westward back in the mid to late 1800’s. Gold inspired many to rapidly leave their former places of employment and families as the promise for “get-rich” gold quickly lured them to points west. I also have images of women and children following behind carefully packed wagons as they headed west to stake their claim for a new homestead. As they walked behind, they were not only lessening the burden for the draft horses or cattle pulling the load, but they were also collecting cow or buffalo chips to fuel the evening fire. Men were likely busy steering the wagons, watching the horizon for the important landmarks along the trail, hunting for an occasional antelope, rabbit, or deer, and keeping a keen eye open for potential encounters with Native American Indian tribes or wily thieves out to ransack the belongings in the wagons. The elements were daunting as the 300 days of sunshine we claim to have in Denver may have only made for long and hot days. Wind storms brewed quickly over the Rocky Mountains and created dust and sand storms. Hailstorms can also wreck havoc. Even more, if a family misjudged their route, lack of water could be a real death sentence. Our New Frontier is a much different place than 150 years ago. Although in May Steve and I felt a bit like the early pioneers, who left treasures behind and took only what was a necessity, yet our downsizing efforts (two trucks and a mini-van versus one small Conestoga wagon) paled in comparison. And, we certainly didn’t have to retrieve manure chips for fuel or hunt for dinner each night (nor did Jeremy or Stephanie who joined us for the first trip to Denver). In some ways though, we do feel a bit like pioneers by striking westward with high hopes of discovering something new! Each week we seem to discover something new whether it is the gold aspens along an unfamiliar and winding road in the mountains, the variety of bike trail options, or the diverse menu of different eateries nearby. We also feel a bit like explorers as we try different routes for getting to places whether by foot, on our two-wheeled wonders, on mass-transit, or in our trusty mini-van. I have discovered the need for humor with Denver streets. Going north-south on the map grid, Denver has many streets named for U.S. states, but they are not in alphabetical or regional order. Then going west-east from University most streets are in alphabetical order. Add a section of downtown Denver with streets that come at a 45 degree angle to further confuse folks. Throw in an assortment of one-way streets and riverbeds. The most gifted orienteer would certainly scratch his or her head. Thank goodness for the mountains. If one can see the mountains, then that is west. Yesterday I opted to walk around our immediate neighborhood to explore since we’ve worn a path between home and campus with very little variance. Of the 79 different neighborhoods in Denver, ours is called the University Neighborhood (go figure, right?). Across the street from us is the Rosedale neighborhood. We have the Washington Park Neighborhood to the north and the Wellshire Neighborhood to the East. As near as I can tell, Cherry Village Neighborhood is to the south. Our neighborhood has many homes similar to ours: small 1500-1700 square feet bungalow, built in the late 1920’s, detached garage accessed from alley, a shared alley with the people on the street behind, small yards, and irrigation systems. Probably a fourth of the original homes have been leveled and larger craftsman style two story homes have replaced them. Home prices for something like our home are roughly $350,000. The new homes are $600,000 and up. (Definitely not in our price range to purchase, so we’ll be reluctantly content paying high rent for now). We could guess-timate that nearly 25% of people own at least one dog. I saw a variety in the home landscapes: cacti, impatiens, geraniums, sunflowers, herbs, vegetables, river rocks, pea gravel, and very messy crab apple trees. We have street names such as: Marion, Lafayette, Humboldt, Franklin, Gilpin, Williams, High, Buchtel, Iowa, Mexico, Colorado, Jewell, Asbury, and Evans. Approaching Buchtel 1/2 mile to the north of us, the traffic noise from I-25 becomes quite evident within a block of it. Fortunately from that point south, the trees and houses seem to buffer the noise. Asbury Elementary School is 1/2 block away to the east of us. I’ve enjoyed walking past the school on my way to campus and from the open windows hearing teachers instructing the students and students’ voices asking questions. We are quite content with our New Frontier with only two exceptions. First, thousands of vehicles drive past our home each day so noise and fumes are issues. Secondly, the sidewalks are notoriously uneven and quite dangerous for walking after dark unless one carries a flashlight. Fortunately we don’t have to send Steve out to hunt or me to gather berries and acorns. (Although Safeway and King Sooper’s Supermarkets are a close second). Eateries abound in our neighborhood as well as the Old Pearl Street and Gaylord Street neighborhoods. Jerusalem Restaurant has middle eastern food. Park Burgers has the thickest burgers. Pajama Baking Company has great baked goods and coffee. Crown Burgers Plus gets a high-five for their Greek combo platter (friends Mark and Carol would love it). Stella’s Coffeehaus has great java and a deck outdoors (Steph enjoyed this spot too). Mustard’s Last Stand is not Portillo’s back in Illinois, but their Chicago-style hot dogs weren’t too bad. Ben & Jerry’s is good, but “Moo-ve” over ’cause Bonnie Brae Ice Cream gives them a good run for their money. Max Gill & Grill has great Cajun flavors. Pete’s University Park and Jordan’s Pub are two good options right across from the University. Okay Partners, I hear the crickets’ familiar nightly refrain (yes, we have loud crickets here) so guess that’s a hint for these Pioneers to turn in for the night. Until next time from the New Frontier!